Juice cleanses made from raw fruits and veggies are not only safe but a great means to cleanse your body and liver from toxins retained from a bad lifestyle of too much alcohol and fast and processed foods. 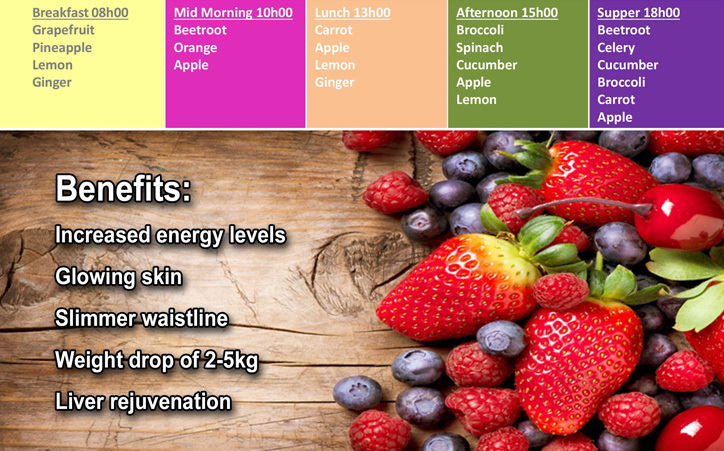 It is recommended to do a detox monthly be it a 3 day or 5 day detox. Our detox package is a balanced program of fruits and vegetables. During the detox period it is recommended that no foods or stimulants of any kind are taken in while on your detox program. You will receive 5 freshly bottled juices daily, each juice different from the other and colour coded as to when to drink them. Many people turn to cleanses because they feel off—they’re bloated and sluggish, dependent on caffeine and junk food cravings, breaking out. When you eliminate toxins from your system, your entire body feels better and reacts both internally and externally. To book your detox please complete the form below? Complete form now and receive a R50 voucher for any service offered by My Renaissance. Powered by : Arihant Webtech Pvt. Ltd.